Kaiser Craft is a crafts manufacturer based out of Australia. I used to love going to shows and hearing that fun accent when strolling the aisles of the event. At one consumer show, we traded extra items at the end of the show, and I got some of their sweet 6 x 6″ paper pads! These little buggers are so darn cute! The paper patterns are awesome, they’re cute and coordinated, and they also include accenting die cuts in each pack. 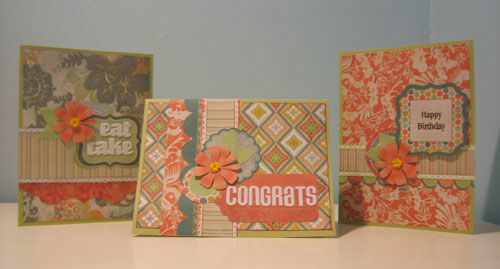 Here are a few cards I made recently with PP825, the third paper pad from the left on the top row of this page. If you’re in the mood for some quick card making, go out and buy one and make a whole stack of cards for future mailings! Happy Birthday to Miss V (soon to be Mrs. H!) who’s bday is today and she received one of these Kaiser Craft Cards!